Last week in GRAD-602, Jeff Nugent led an exploration on assessment. We noted that a distinction can be made between learning for mastery versus the traditional approach that typically leads to sorting and sifting students. This provided a segway to the evening’s focus on formative and summative assessment. In class, we brainstormed ways in which we have experienced assessment within our disciplines, and tests, quizzes, papers and performance observations were the traditional practices that came to the surface. These forms of assessment, while very important, are often the only means used in teaching for demonstrating what students are learning. They are audits of learning. What is often overlooked, or given less consideration, are assessment techniques that are aimed at improving student performance and understanding about “how” they are learning. This latter type of assessment, sometimes called formative, provides learners with important feedback about how they are learning and how they can improve what they are doing. This kind of assessment is not an audit of learning, like a test or quiz, but rather an approach to assessment that values learning as an iterative process of growth through loops of practice, performance, and feedback. 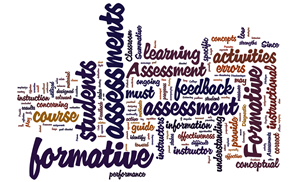 As Jeanette noted, formative assessment allows students to fail forward. To illustrate these two notions, Jeff modeled a traditional approach to learning with a quick lesson on “the montilization of Traxoline.” No talking was allowed, instruction was delivered in a jargon-heavy manner, and then rote memorization was assessed without determining understanding. The alternate model involved a classic physical science exploration of mass, weight, volume, and displacement with the floating ice cube problem. A problem was explained, understanding was diagnosed, opportunity was provided for discussion, and prior knowledge was surfaced and made visible using Poll Everywhere. This process would allow an instructor the opportunity to adjust her or his instruction to ensure mastery. Our classes only last 100 minutes, and so we (as always) were left with feelings that we did not discuss all that we desired. So, we sat down around my office table this morning to record another podcast. In this session, Jeff, David McLeod, and I discuss aspects of power that arise from assessments, the problem with assessing higher order thinking with multiple-choice tests, and dip our toes into the idea of tests as “objective” measures. I have fallen off of the blog reading ban wagon this spring. My MOOC classes and volunteer work has kept me rather busy these days. It appears as though I’ve missed some interesting conversations! This is a very powerful podcast and one that should certainly extend beyond the classroom. The conversation raised many important ideas that should swirl around in the head of anyone who desires to step into the classroom. The question of how to engage students in their own learning is one that’s so contrary to the “baby bird” syndrome prevalent in our society. Every once in awhile a student comes to class with something to contribute to the lesson, shares how they have extended the thinking and conversation beyond the time frame of the class. I’m so pleased when this ownership occurs! An entire paradigm change needs to occur in our thinking about who owns the knowledge and the classroom. I am not sure if it should start from the bottom and move upwards, from the top and move downwards or should attempt to meet in the middle. Students are always shocked when I return a project or work and ask that it be reworked Parents are thrilled because it means that a lower grade can be erased. Other classroom teachers have snarled at me and chide me for being one of those “developmental” teacher. Oh, you’re one of them….